However, after taking some time to decompress from his previous rollercoaster band life and the feverish days of launching a solo career, Peter is strolling down a new path. Hungry for simplicity, thirsty for honesty, Peter backed away from his label and worked on a new project, Sun and Shield. And this time, he’s got company— Dave Ghazarian (Superchick, Audio Adrenaline) on bass and Jeff Irizarry on drums. Another song on the album is a family affair. Peter’s father-in-law, Mylon Le Fevre (Mylon and Broken Heart), provides vocals, which takes it to a new place. Summer Furler joined her husband in penning the song, much to Peter’s delight. 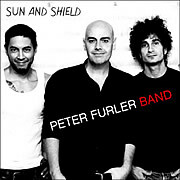 Sun and Shield is indicative of the monumental evolution — though still in its infancy — of Peter’s solo efforts. Trusting the lyric and the musicality of each track to stand on their own, the record captures a seasoned artist preserving the integrity of his craft rather than entrusting it to production. Much like his life overall, the music, the faith and the message of Peter Furler Band resonate with effortless artistry and undeniable faith.